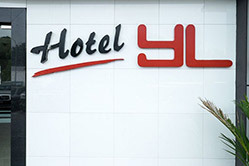 Hotel YL is a budget hotel located in the heart of Kajang, Selangor. Our hotel is 15 to 20 minutes drive from Putrajaya. It is also located within easy reach of hospitals, restaurants, college & university, entertainment and shopping centres. You can find a wide stretch of restaurants near our hotel such as Restoran Sate Kajang Haji Samuri, Happy Farm Restaurant, Kajang Laksa Keong and Little Seven Wanders Kitchen. Our hotel provides facilities such as air-cond room, attached bathroom with hot & cold shower, LCD/colour TV with selected ASTRO channels, lift, telephone, Wi-Fi, 24 hours reception service, hot & cold water dispenser, CCTV security system and free parking. We are the most affordable budget hotel that you are looking for in Kajang. We guarantee to provide you the best room with lower accommodation fees. If you have any questions or need more information, please contact us. We will be pleased to answer any enquiries you have.